I asked you to tell me at every step if you don’t understand something. You said nothing! 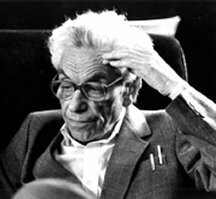 In honor of Paul Erdős’s 100th birthday (March 26), I wanted to share one of my favorite stories involving his attempt to prove the irrationality of the square root of 2 to a non-mathematician. “Why didn’t you tell me at the beginning that this is all wrong?” said Laura. Erdos flipped his top. I recalled that when Albert Einstein gave one of his last talks, at the end they unscrewed the black board and sent it to the Smithsonian. 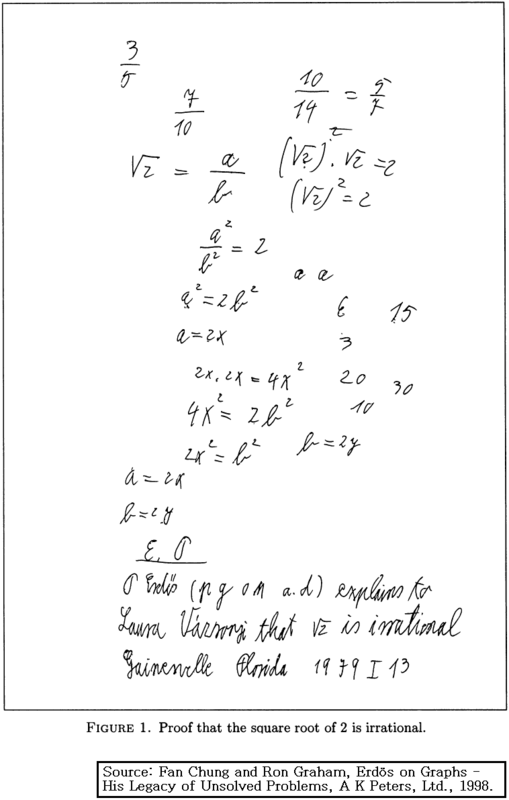 So I asked Erdos to certify the document, so I could keep it for history. He signed his name and p g o m a. d, signifying Poor Great Old Man Archeological Discovery. At age 70 he started to use LD for Legally Dead, and at 75 CD for Count Dead, for reasons unknown to me. Beautiful, isn’t it. Happy 100th, Paul! Thanks for all the great memories – and, of course, mathematics! Certainly he did not mean that a and b are whole numbers, because of the possibility of either an indeterminate form or division by zero (infinity).